The Country concept from Proton and Italdesign features 1350mm-long driver and passenger doors. TURIN – Lotus Engineering is providing the hybrid drivetrain for a family of minicars being co-developed by Malaysian automaker Proton and Italy’s Italdesign Giugiaro. The range of concept cars is set to debut at the Geneva auto show next week. So far, Proton and Italdesign have released photos and details on two of the concepts, the three-door “Country” version was revealed today while a five-door variant was announced February 11. Lotus Engineering designed and integrated its electrical drive system, single-speed transmission and Lotus Range Extender engine into the plug-in vehicles. Lotus uses a 1.2-liter, three-cylinder internal combustion engine to recharge the concepts’ battery packs and provide electric power for the drive motor when battery levels are low. The engine can run on gasoline, ethanol or methanol. The concepts’ batteries also can be recharged by plugging into a household electric outlet. General Motors Co. also will rely on batteries and a range-extending engine to power the Chevrolet Volt and Opel/Vauxhall Ampera plug-in hybrids. The Volt launches in select U.S. markets later this year. The Ampera will go on sale in Europe next year. Lotus Engineering is the automotive consultancy division of Lotus Cars Ltd., which is owned by Proton. 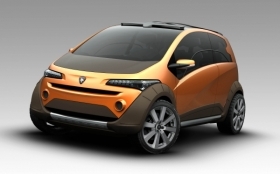 The Proton-Italdesign concepts are both 3550mm long, which is about the same size as a Fiat Panda minicar. Key differences between the cars are that the five-door version has room for four people while the Country has room for five passengers and has bigger driver and passenger doors – each is 1350mm long to allow easy access to the front and back of the car. The aim of this project is to provide Proton with eco-friendly cars that meet global safety and emissions standards so that the automaker can expand its footprint. Proton has built more than 3 million vehicles during its 25-year history but few of them are sold outside Asia. Proton has not yet said whether it plans to turn the concepts into production models. The car range is supposed to feature models that not only emit few emissions but also provide superior functionality. Italdesign Giugiaro created a specific platform for the new car range, which features a raised floorpan to accommodate the hybrid system’s batteries in center of the car.